Ted Cruz fractures GOP over "New York values"
Republican presidential candidate and Texas Sen. Ted Cruz prompted a vicious defense of New York City from Donald Trump during last week's Republican debate in South Carolina. Days later, as the nation's first nominating contests draw nearer, the debate over the metropolitan area and its "values" continues to snowball, with Cruz doubling down on the line of attack. On Fox News Sunday, Cruz chastised Trump over denying that a more liberal viewpoint pervades in the city. "That formulation didn't come from me. It came from Donald Trump. Donald Trump, when he was being interviewed by Tim Russert, when he was explaining his views a number of years ago," Cruz said, referring to a 1999 interview with NBC News. In that "Meet the Press" broadcast, the billionaire was questioned over his support of abortion and gay individuals serving in the military. Trump told Russert in response, "I've lived in New York City in Manhattan all my life, ok? So, you know, my views are a little bit different than if I lived in Iowa." 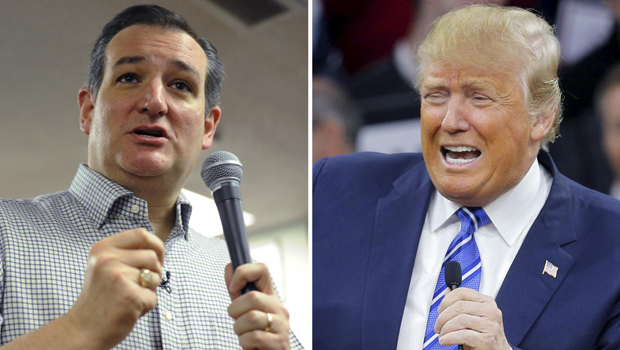 Cruz likened his rival to Democrats who similarly defended New York. "I would point out it's a view echoed by far left liberal Democratic politicians like Andrew Cuomo, Bill de Blasio, Hillary Clinton, and Donald Trump has supported those candidates and supported their positions on a lot of issues," he said. The Texas senator also drew the "media elite" of New York City and Washington, D.C. into the battle, saying they "run around with their hair on fire wondering what on earth are New York values." "I'll tell you and the rest of the country," he said. "People understand exactly what that is. In South Carolina when I was there, the people there certainly understand it." Trump fired back at Cruz Sunday, labeling him a "very strident" person whose attack on New Yorkers was vague and untrue. "I'm not sure that he knows what he means, to be honest with you," Trump told CNN. "I thought it was very, very insulting and I immediately thought of the World Trade Center and the bravery of New Yorkers and the genius of New Yorkers to be able to take that whole section and rebuild after the tragedy -- the worst thing that ever happened to our nation in terms of an attack." In a separate interview with ABC News on Sunday, Trump called Cruz "a nasty guy" who had previously been "so nice to me" before their relationship soured over the past few weeks. "Nobody likes him," he said. "Nobody in Congress likes him. Nobody likes him anywhere once they get to know him...he's got an edge that's not good. You can't make deals with people like that and it's not a good thing." When pressed on his 1999 interview with NBC, Trump pivoted instead to bash Cruz as a "hypocrite" over taking money from New Yorkers. "How about his fundraising and how about when he does his personal financial disclosure form, and he doesn't put on that he's borrowing money from Goldman Sachs and then today it comes out that he's also borrowing money from CitiBank and he doesn't list it," Trump said. The billionaire was referring to the latest controversy over Cruz neglecting to file paperwork with the Federal Elections Committee about a million-dollar loan he received from Goldman Sachs and Citibank during his 2012 Senate bid. Cruz has said his failure to disclose the cash with the FEC was an "inadvertent filing error." Florida Sen. Marco Rubio, whose uptick in recent polls puts him in the running for a third place finish in the early-nominating states of Iowa and New Hampshire, offered up some criticism for Cruz as well. "The fact of the matter is, that Ted has shown a propensity throughout his career in the U.S. Senate to take one position in front of one audience and then change his position in front of another," Rubio told NBC News in a Sunday interview. "So he raises money in New York and then criticizes New York values." The Florida Republican added that he himself has "never used" the phrase "New York values" in his campaign. "I think we're all Americans," he said. "I'm campaigning on behalf of American values and I don't seek to divide people against each other. That's the problem we have with the current president."